We're still having a beautiful warm September here on the west coast, but the evenings have that fall chill that I love. 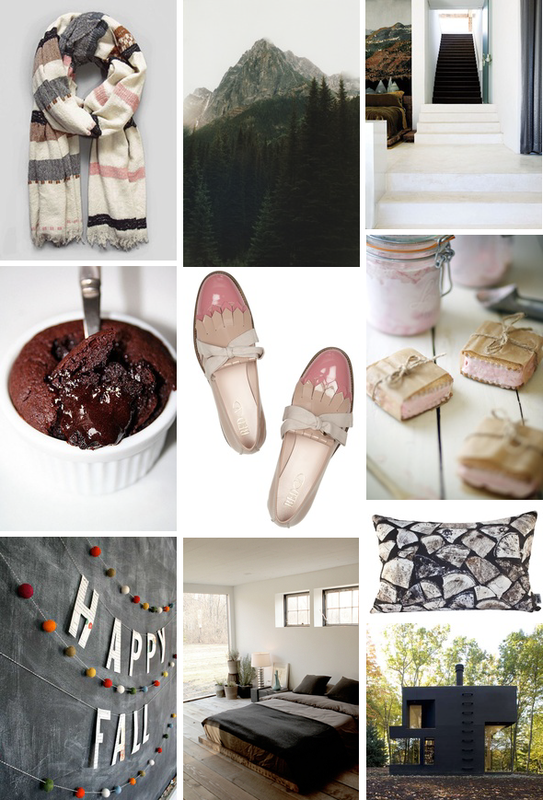 Feeling fall-ish today; a few cosy images and links to go with them. I can't believe how lucky we've been with the weather this month! I wish every September was like this! this has been the loveliest fall i can remember... hoping it sticks around well into october! Oh man, I'm loving this color combo. It reminds me of Neapolitan ice cream, which is such a comforting childhood memory for me. Perfect for fall! I love that scarf... and the whole vibe of this photo collage. Very fall-feeling indeed. Pretty Mommy - such a great scarf and nice shop! Oh ! Thank you for this so inspiring collection ! In love with the chocolate cake and the felt banner ! We felt the weather changing few weeks ago here in Switzerland. Beautiful post! I've been loving pink lately. Such a lovely color palette for the fall. Love the scarf and those ice cream sandwiches look so yummy! I absolutely love this post...the colors, the designs, the images...it's such a beautiful ode to fall!